The Premier was speaking on Thursday during his visit to the thriving Yes4Youth Hub in Tembisa, Ekurhuleni. The visit forms part of the provincial government’s drive to upscale the Tshepo 1 Million youth empowerment programme and link it to opportunities in the township economy as announced in the political report last Friday. The initiative is a business-led collaboration with government and labour to create one million job opportunities. The hub is the first of its kind in the province. It is a one-stop facility, bringing investment and technology into the heart of communities, where the youth are. The Hub houses various youth businesses, from hydroponics that grow different types of lettuce and aquaponics that farms fish which assist in fertilising herbs and vegetables. Aquaponics also assists with intensive land usage instead of extensive land usage and assisting in developing the next generation of farmers while contribution to food security. 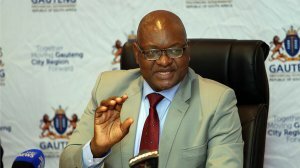 Premier Makhura said the Small Enterprise Development Agency (SEDA) and Gauteng Enterprise Propeller (GEP) will be brought to the centre to offer more support to township businesses. Accompanied by Ekurhuleni mayor Mzwandile Masina, The premier said the reason for his visit was also to offer non-financial support to township businesses. “We are working hard to kill the idea that you need to know someone to get government business in Gauteng. “We are striving for clean governance hence the introduction of open tender system. You must get a job on basis of merit not because of your connections,” said Makhura. Premier said it was for this reason that the fifth administration decided to prioritise township economy. He said Gauteng wanted to bring mainstream economy to the township. The Gauteng Provincial Government has renovated 30 townships industrial parks, announced the premier. Meanwhile, Mayor Masina urged local entrepreneurs to organise themselves and work together to access government assistance easily. “Entrepreneurship is the way to go and it’s assisting in resolving some of the challenges faced by our communities,” said Masina.